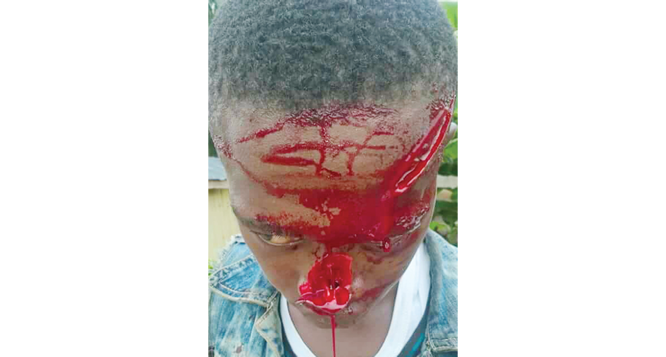 A young man, identified simply as Peace, got inflicted with machete cut injuries after he fought his ex-girlfriend’s new lover at Amaoba-Ime, Umuahia area of Abia State. Witnesses said that Peace and his opponent, Divine Ndudim aka Defence, were rushed to the Federal Medical Centre (FMC), Umuahia, Abia State, after a bloody fight over a lady called Felicity Ogechi. While Peace had his forehead and nose sliced, Ndudim sustained a swollen hand and had internal bleeding. The incident has plunged the community, Amaoba-Ime into shock. Some of the elders in the community said that it was a taboo for two persons from the same village to fight and shed blood. The taboo is called ‘Erim.’ The consequence of that spilling blood is death; if a spiritual cleansing is not quickly carried out. Peace was Ogechi’s former lover until he turned her to a punching bag. Ogechi borne the beatings until Peace called it quits between them. It was gathered that several attempts made by Ogechi to start a new relationship always failed because Peace would threaten and sometimes attack every prospective lover. Ndudim, who just came from Lagos State to the village, saw Ogechi and fell in love with her. He expressed his feelings for her and she accepted. The relationship was already beginning to take root, when Peace heard about it and went after Ndudim. Witnesses said that Peace took to attacking and beating Ndudim. Ndudim bore the beating and humiliation. But on that fateful day of April 22, Peace came to attack Ndudim again, but got more than he bargained for. “It was Peace that started the trouble. He has been harassing Ndudim for long. Peace is a former lover of Ogechi. He used to beat her every day. He was also the one that told Ogechi that it was over between them. After breaking up with her, he refused to allow any guy to date her in the community.Peace used to harass and threaten any guy that wants to date Ogechi. Peace even threatened to kill Ndudim if he sees him with Ogechi.“On the eve of the fight that led to the machete being used, Ndudim was seeing Ogechi off, when Peace suddenly jumped out from the bush and, as usual, pounced on Ndudim. He beat him up.The following morning, Peace saw Ndudim and this time, attacked him with a stick. Unfortunately, Peace attacked Ndudim in the presence of his brother.The brother ran and returned with a machete and attacked Peace.”The machete cuts were so severe that Peace was rushed to the hospital, where his injuries were stitched to save him from bleeding to death.Ndudim, who was attacked with a stick, was also taken to the hospital. Doctors said he has internal bleeding and that the blood would have to be sucked out to save his life.Family members of Ndudim were said to have been spending a lot of money on medical bills since the incident. The matter was later reported to the police and investigation started. The incident between Peace and Ndudim spread after a closed group, ‘Amaoba My Home For Life, shared it on its wall. Some of the group members, who are from the same community as Peace and Ndudim, have expressed shock and revulsion over the bloody incident. Mazi Emeka Ijiomah was the first person to share the post. “The young man is alive. He is receiving treatment at FMC Umuahia. He saw his former lover with another guy and beat the guy up. He did it on the first and second day.